Tuesday: From Glasgow we drove our touring family to Loch Lomond with a brief stop for the view, then via Inveraray to Kilmartin Glen, where Scottish history began. It was here our troubles began … a timber wagon had shed its load, forcing us to retrace our route back to Inveraray – a pain and waste of time. We called ahead and arranged lunch for everyone, phew. Some free time here then away under the arch up to Loch Awe and on to Oban. As I left for my hotel, McLean’s could be seen dondering around the delights of Oban! The Isle of Mull Wednesday: Oban to Mull. We drove the short distance to the ferry terminal and sailed 45 minutes, landing at Craignure (having passed Duart Castle on our way) we turned left to visit the castle. The family got to see inside the great hall, the views from the 13th Century keep and even got to meet the Chief. Duart Castle has a great tea room and gift shop – the perfect place for refreshments. Our McLean’s really enjoyed their clan castle and, aye even met the chief in person. Lunch in the Craignure Inn was good! With our bellies full, we drove on to Salen for a quick visit to see the Maclean graves at the graveyard. The graves are located outside the chapel as this chief/wife were considered witches! From here we followed the narrow single track road to Tobermory, where we dropped off the luggage and enjoyed free time. With great little shops, 3 pubs, a bank and several places for food/drink – it’s a great place to stop for a breather and a bit of real Scottish life. Dinner was pre booked at MacGochans pub, next to the distillery, and we spent some time with owner Neil who is a good pal. His pub is full of superb food, many great whiskies, and drinks of every description. That night many of our guests went into the Mishnish pub to see the Mad Ferrets! A superb duo and well worth seeing if you get the chance. Maclean lands – Inverness Thursday: After a good nights sleep, we caught the ferry to the mainland (Lochaline) and then drove to the Corran ferry. A scenic drive took us over to Fort William, stopping for lunch at the Spean Bridge woollen mill. From here we wound our way through the Great Glen to the famous Loch Ness and on to Inverness. Driving past the city (with terrible traffic jams) we stopped at Culloden Battlefield, where Liz joined the group – as usual she is the life and soul of the coach. From here it took a quick drive to the hotel in Nairn. As we do normally on tour together – we researched some whisky! Whisky and Aberdeen Friday: We visited the beautiful Cawdor Castle which dates back to the 14th century and is very much still in use. The whole family enjoyed being steeped in the history of it. We then pressed on to whisky country, Glen Moray Distillery. This is one of 49 distilleries in this region, French owned and the largest Scotch single malt whisky drank in France. 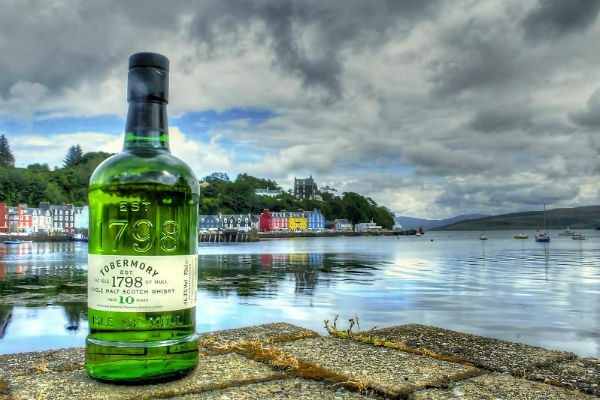 They have just undergone a huge expansion programme, as whisky is in great demand worldwide. We then headed east for a pre planned stop in Inverurie, where friends of the group met us, we lost 8 of them going to tour a fish factory. From here the main group drove to our Aberdeen hotel. Edinburgh Saturday: Passing ever changing landscapes calling in at St Andrews for a sunny two hour break and over the Forth Road Bridge and on to Edinburgh. Sunday: The last day of the 6-day tour was spent enjoying the famous architecture of Edinburgh. There is so much to see in this beautiful city and everywhere you look gives you views of the centuries that have gone before. It really is a magical city.